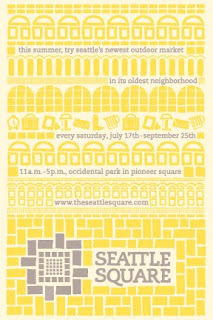 A cute postcard design caught my eye at the Urban Craft Uprising last weekened promoting the new outdoor market in Pioneer Square called Seattle Square. 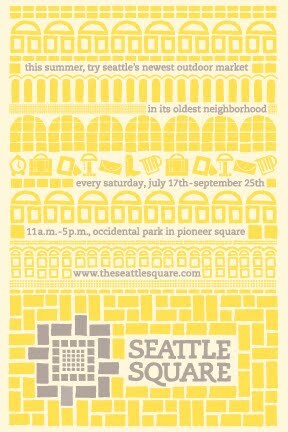 Held every Saturday for the rest of the summer at Occidental Park from 11:00 a.m. to 5:00 p.m., Seattle Square hopes to invigorate the neighbourhood with local Seattle designers, food, public art, music and vintage treasures. They have everybody covered with a wide range of vintage and craft vendors; selling everything from locally designed clothing, to handmade housewares and accessories, to mid-century modern furniture. To top it off, local and national DJ's will be providing a soulful, upbeat soundtrack each afternoon in the park. Seattle's newest food carts like Street Treats as well as some classics like Skillet and Parfait Organic Ice Cream will also be on-site, so make sure you go hungry! Seattle Square also plans to have a rotating cast of local and national DJ talent along with a series of public art installations - think Brooklyn Flea (plan your next trip around this folks!) meets MoMA's PS1 and Seattle's Mobile Chowdown (another must visit!). For more information, visit their wesite here. Vancouver's only 2.5-3 hours away from Seattle depending on border line ups and traffic, so no more excuses! Summer's not complete with at least one road trip!